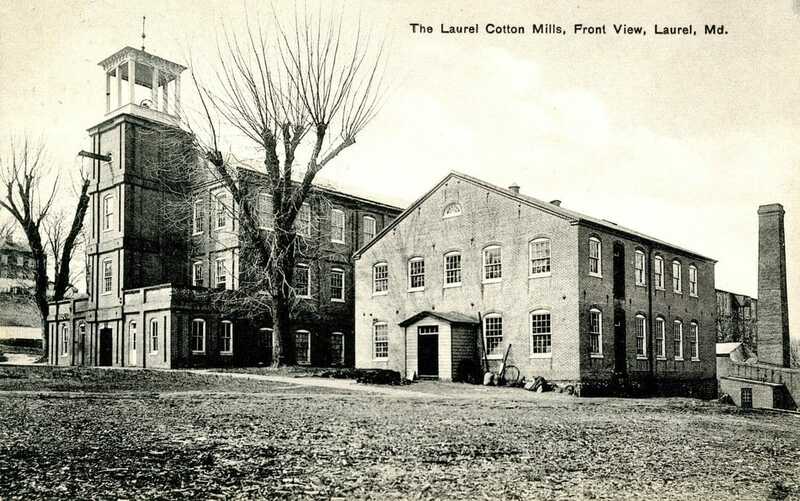 The exhibit explored Laurel’s history as a mill town and the community’s early growth. Using a real 1870s family to tell the story, it introduced visitors to the lives and experiences of the hundreds of men, women and children who worked in town’s cotton mill between the 1830s-1929, when the mill closed for good. Using the 10-member Waterman family, selected from 1870s census records, visitors learned about the jobs different members of the family, including its seven children, might have performed at the cotton mill. Visitors were given a card for one of the family members and followed them through the exhibit. An adult visitor might have follow Mark Waterman, 49, who may have worked in the picking room at the mill, where once the cotton bales were moved into the picking room, the cotton was unpacked and debris such as twigs, leaves, and bugs were removed. He might have earned: $7.43/wk or 11 cents/hr. A younger visitor might follow Sarah, his 13 year –old daughter, who may have worked as a creeler in the weaving room, making sure there was a constant supply of fresh bobbins for the cotton emerging from the card frames. She would have earned $4.00/wk or 6 cents/hr. In a paymaster’s section of this room, and in an area in the Museum’s downstairs, visitors learn firsthand what these wages might have purchased. The exhibitions’ second area re-created an 1870s mill workers home in the Laurel Museum’s building. This was the first time that the Laurel Historical Society re-created millworkers' quarters. Housing 10 people (9 family members and one other individual) the space would likely have been very crowded, with multiple children sharing beds and bedrolls. In addition to bedding, and trunks to store items, the space includes 3 kinds of lighting (kerosene, candle and oil), 2 types of heating (wood and coal), a chamber pot, sewing implements, fishing rod, baseball bat, clothing, and other items of everyday life that might have been present in a mill family home. The Laurel Museum building was originally 4 separate apartments, with individual kitchens for each family in the basement. The re-creation also included a basement kitchen set-up as the 1870s family might have had, and where, the exhibit speculates, Virginia Bradley, a 25 year-old, white female listed as living with the family, might have slept. True Life: I am a Laurel mill worker ran through December, 2012. Our Opening was featured on WAMU's Art Beat. Check it out here. The Gazette ran a great article following our exhibit opening. Check it out here. The Laurel Leader also featured a great article on us. Check it out here. All collections related to Lewis Hine, an early 20th century worker for the National Labor Committee. Massachussetts report covering quite a bit about Mill Labor. Further information on the people in Lewis Hine's images. Work in a textile mill. Part of the Learn NC project. An excerpt from "Like a Family: The Making of a Southern Cotton Mill World"
More Excerpts from "Like a Family: The Making of a Southern Cotton Mill World"
Part of the Academic American History Project. Part of the Child Labor Public Education Project of the University of Iowa Labor Center and Center for Human Rights.